(Bridgewater, N.J., Jan. 28, 2019) - The Somerset Patriots have signed 2018 Frontier League Pitcher of the Year Thomas Dorminy for the 2019 season. Dorminy enters his first season with the Somerset Patriots and first in the Atlantic League. The left-handed starter dominated in his lone season with the Washington Wild Things last year. Dorminy posted a 9-5 record with a league-best 2.45 ERA and 109 strikeouts over 132.1 innings pitched. His 2.45 ERA was over 30 points lower than the next closest qualified pitcher in the league, while his nine wins ranked third in the league. The Faulkner University product also finished third in the league in innings pitched and sixth in strikeouts. The Lutz, Florida native racked up a number of accolades in his time with the Wild Things. Not only was Dorminy named the league’s pitcher of the year, but he was also selected as both a Mid-Season and a Post-Season All-Star. 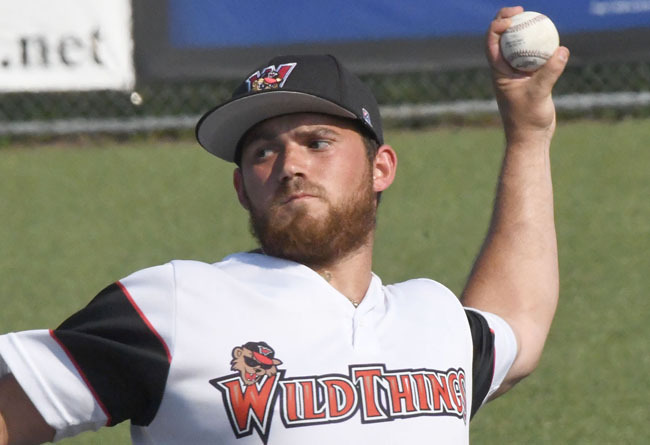 Additionally, the southpaw made eight starts without allowing an earned run over the regular season, was the winning pitcher in the Frontier League All-Star Game and posted a 2-1 record with a 2.14 ERA and 23 strikeouts over three postseason games for the Wild Things. Dorminy spent the first four years of his professional career in the San Diego Padres organization prior to joining the Wild Things. He made 95 appearances (64 starts) in his time as a Padres farmhand, including a notable 2015 season. The 26 year-old went 11-7 with a 2.94 ERA over 25 starts with Single-A Fort Wayne that season, en route a Mid-Season All-Star selection. He was also named a MiLB.com Padres Organization All-Star for his impressive campaign. The former 10th round draft pick carries 27 wins and a 3.67 ERA over 116 games (85 starts) in his five-year professional career.